This winters shopping trolly essential, a range of vitamin-enriched drinks designed especially for children; A Little More. The range has been designed to help kids achieve an optimum benefit from their daily diet, in a tasty and convenient way. 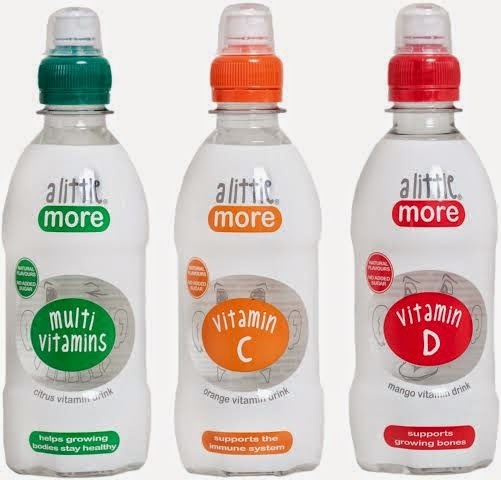 The ‘A Little More’ range is one of the first drinks of its kind; the drink for kids is a refreshing blend of natural fruit flavours and spring water, making it an easy way to ensure kids achieve their daily vitamin intake in a fun and delicious way. 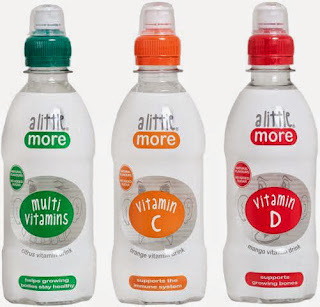 For parents who struggle to get their children to enjoy fruit and vegetables, these multi-vitamin drinks are the perfect solution. These fresh drinks not only contain the core essential vitamins to promote overall health and well-being, but they are also made with no added sugar and spring water – perfect for those thirst-quenching moments. Each drink is naturally flavoured – orange, citrus or mango & passion fruit - to ensure that taste is not compromised. It can be enjoyed by children over 3 years of age. The small, easy-to-carry bottles, complete with a convenient sports cap, make it a perfect addition to any packed lunch, picnic or a simple daily nutritious treat. This Christmas Mummy To The Max has teamed up with A Little More to offer one lucky reader the chance to win a months supply of drinks. To enter all you simply need to do is enter the simple rafflecopter below. These are such a great idea - i'm terrible at taking my vitamins.